THE discovery of a skeleton inside a 2,000-year-old tomb near Beijing has set the Chinese capital abuzz—it could belong either to a Chinese prince or a petty grave robber. The tomb is believed to have been built during the Han dynasty (206 BC–AD 220) and, if confirmed, examination of its contents could add significantly to the understanding of Han Chinese and their culture during that period of Chinese history. But the most important find is a skeleton, although incomplete, which has sparked speculation that it could be that of a son of the dynasty's first emperor, Han Wudi, according to the online newspaper Sohu.com. Liu Dan, the emperor's third son, tried but failed to get his father to make him Crown Prince after the death of his two older brothers. After Han Wudi died, Liu Dan and his sister plotted to overthrow his younger brother, who had been made Crown Prince. He was forced to take his own life when his plot was exposed. 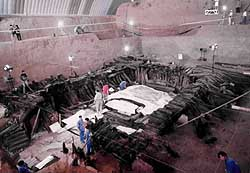 Two reasons have led archaeologists to believe the skeleton is Liu Dan's. First, they have deduced that it belongs to a male, about 1.6 m tall and aged between 35 and 40. Second, they have found a structure made up of piled-up wooden poles, which was used only by members of the imperial family, to protect the coffins inside the tomb. However, there are signs that the tomb has been broken into. This has led some experts to believe that the skeleton could be that of a grave robber. The fact that the tomb's location is a mere 18 km from Tiananmen Square, in a place called Laoshan in western Beijing, adds to the excitement. The archaeologists, whose painstaking work is being beamed live to viewers nationwide, have so far unearthed lacquerware, pottery, silverware and some pieces of jade. Other items uncovered from the tomb include well-preserved tiles, grain and a screen believed to have been used by wealthy people. Lacquerware, covered with vivid pictures, has also been found. These, archaeologists say, can provide insights into the culture, trends and religious beliefs of the time. According to the experts, such items, more commonly found in the south, are rare archaeological findings for the northern region, thus making them highly valuable. The unearthing of the tomb, which began in February, has sparked so much interest that China's largest television station, China Central Television, has been showing on-going excavation work live since Aug 20. This is the first time the station is providing such coverage. Security around the excavation site has also been beefed up, as countless television station workers and journalists from around the country have converged on the site for a glimpse of the tomb. Archaeologists involved in the project are struggling to preserve the rotting timber, the main material used in the construction of the tomb. To protect the structure and arrest any further damage to the relics inside, the State Bureau of Cultural Heritage in Beijing has, with the help of experts, begun the work of preserving the relics. Once unearthed, they are given a protective coating. But this preservation work carries a heavy price tag. According to some press reports, the first phase of timber preservation has already cost a hefty 350,000 yuan (S$66,500). As the entire effort could run into millions of yuan, experts are looking for sponsors to keep the project going. A MUSEUM researcher at the Lee Kong Chian Museum in the National University of Singapore believes that the discovery of the Laoshan tomb (above) will help in an understanding of the Han burial system. Ms Cao Yin, a trained archaeologist from Beijing University, feels the live television coverage of the excavation works, as seen in the picture, will also serve to educate the Chinese about their value. The Chinese government wants to send the message countrywide that the significance and value of ancient remains can best be understood through archaeological excavations, she said.